Identity theft is something that both consumers and retailers struggle with. On the consumer side, if your identity is stolen, reclaiming it is a long, arduous process that may cost you thousands of dollars. This is an invisible crime in that finding the thieves is difficult, if not impossible. In addition, you’re left with the burden of proving you are really you and that you didn’t charge up thousands of dollars. Retailers also need to protect your identity. Target is facing a backlash and lawsuits thanks to the recent security breach that may have put 110 million customers at risk. In addition to stealing credit card numbers, Target now admits that thieves were able to also get people’s names, mailing addresses, e-mail addresses, and phone numbers. The information is being sold on the black market. As if that isn’t bad enough, Neiman-Marcus also recently admitted to their own security breach during the holiday shopping season. If you prefer to use credit cards for the convenience as well as the credit card rewards, you may instead choose to freeze your credit. This is the most fail-proof way to protect your identity. When you freeze your credit, your credit profile goes on lock down. That means that no one can conduct a credit inquiry or open a new line of credit in your name. That includes you. This can be inconvenient if you cherish getting credit card offers in the mail (those will cease almost immediately) or if you like to open new credit card accounts on the spur of the moment, when you’re shopping, for instance. However, freezing your credit means that no one, not even the thief who has gotten your information, can open an account. I find that incredibly reassuring. You can choose to apply for the freeze online. You’ll then be asked to enter some personal information and pay your fee. A few days later, you’ll receive a notice from the credit bureau stating that your account has been frozen. You’ll also be given a pin number. Keep this in a safe place! You cannot thaw your credit without this number. Also, if you’re married, to be completely secure, both you and your spouse should freeze your credit. Some credit bureaus even let you freeze a minor’s identity. Is Freezing Your Credit Fool Proof? Nothing is fool proof, but if you freeze your credit, no new lines of credit can be opened. You will still be vulnerable to identity theft with your current credit accounts. Therefore, you’ll want to continue to monitor those every month. To thaw your credit, you simply contact the credit bureau, give them your pin number, and request a temporary or permanent lift of your security freeze. Some credit bureaus do this for free, and others charge a small fee (typically $10). 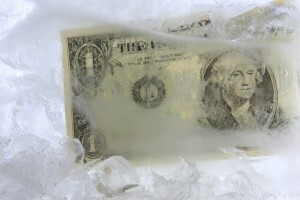 Thawing your credit for all three credit bureaus is usually not necessary. My husband and I have had our credit frozen for four years now. When we do need to grant access to our credit line, I ask the company what credit bureau they use for their credit checks. Then we just temporarily thaw our credit at that one bureau. While thawing your credit can be an inconvenience, it’s a minor inconvenience that I’ll put up with to keep my identity safe. Dealing with the ramifications of identity theft is a long, difficult battle I’d rather not endure. Have you taken the steps to freeze your credit? If not, are you considering it? I have never thought about doing this but I have experienced a lot of credit phishing scams lately. You can’t really trust anyone or anything right now. only reason for that is I’ve got pretty good protection from identity theft, and truth be told, I don’t have any debt…well other than my car which is almost paid off. I was a lucky one. As I grew up, I learned about credit and debt. Today, I’m more afraid of overwhelming debt than poisonous snakes, and that’s something I’m very proud of. This a good one to keep in the old knowledge tank for future reference, thanks. Great tips….and just another reason why I like to pay for everything I can with CASH! I actually didn’t know you could do this. In this day and age, with all the issues in the news, this would be a good idea to consider.